A red wolf is seen in an enclosure at Reflection Riding Arboretum and Nature Center on Thursday, July 26, 2018, in Chattanooga, Tenn. The center is part of a national conservation program helping to breed and repopulate endangered red wolves. Public comments can be submitted online at regulations.gov by entering docket number “FWS-R4-ES-2018-0035” in the search box. Public comments must be received by July 30, 2018 at 11:59 p.m. POLL: Have you seen a red wolf? A federal proposal would shrink the nation's only protected habitat for critically endangered red wolves by more than 85 percent and allow people to shoot and kill wolves found outside the designated area. The proposal is a sharp blow to a 30-year program — which, in part, takes place in Chattanooga — attempting to re-establish the animal's population. "The U.S. Fish and Wildlife Service is looking to scale this program back further, basically to the point of extinction in the wild," Southern Environmental Law Center attorney Sierra Weaver said. The law center is representing three clients suing the North Carolina Wildlife Resources Commission and U.S. Fish and Wildlife to address what they see as a threat against the animal's population. However, officials with the federal agency are responding to private landowners concerned about coyotes and shrinking habitat in hopes of better managing a program that has largely failed. It's a plan officials believe could help the population, a claim other groups attempting to restore the wolves say is patently false. By the 1970s, red wolves were nearly gone. Fewer than 20 wild wolves remained spread along the eastern United States. Habitat reduction and programs to quell wolf and bear predation had slowly decimated the population. The remaining wolves were put in captivity to be bred and protected, and the animal was officially declared extinct in the wild. Conservationists formed a species survival plan and worked to stabilize population numbers. The coordinated effort included zoos, U.S. Fish and Wildlife and other organizations, including Chattanooga-based Reflection Riding Arboretum and Nature Center. The partners agreed to house and care for the wolves, participate in captive breeding, make recommendations for release, conduct research and raise awareness, according to program participant New York Wolf Conservation Center. At first, the restoration program was successful. By 1987, red wolves were ready to be reintroduced in the wild, and an area that would eventually include 1.7-million acres in North Carolina was selected for the release. The population grew to about 100 wolves over the next 25 years, until human activity reversed the progress. Vehicles, habitat loss, hunters and landowners, who often mistook the wolves for coyotes, severely reduced the population. Today, U.S. Fish and Wildlife estimates 35 red wolves remain in the wild. A U.S. Fish and Wildlife study released earlier this year confirmed red wolves were on the path to extinction once again. The study pointed to poor management and opposition from private citizens and game wardens as leading causes. Participants in the Red Wolf Species Survival Plan had a threefold plan to help the federal agency restore the population. It included educating the public, building the rural North Carolina economy around wildlife, and potential reintroduction into a second habitat. However, the federal agency had its own plan to concentrate resources to a smaller area. The plan would cut out management efforts on private land and refocus efforts in the public Alligator River National Wildlife Refuge and Dare County Bombing Range, shrinking the protected habitat from 1.7 million acres to about 240,000. "By restricting management to Alligator River National Wildlife Refuge and the Dare County Bombing Range, we will ensure we can better reduce external threats and monitor the environments surrounding these wild wolves," U.S. Fish and Wildlife Principal Deputy Director Greg Sheehan said via a release. "A recent Species Status Assessment informed us that past strategies were not effectively leading to recovery, so we believe that a concerted effort in a managed area will help." "This proposal is not going in that direction," said Mark McKnight, president of Reflection Riding Arboretum and Nature Center in Chattanooga. "This is not helpful." The center's director of wildlife, Tish Gailmard, found the proposal "very discouraging." Gailmard is active in overseeing the protection plan, sits on the Red Wolf Management Team and cares for the six red wolves now held at the nature center. She and McKnight believe working in conjunction with private North Carolina landowners would reverse the problem and restore population. For them, it's about educating the public and working in tandem with their needs. The protected North Carolina area is extremely rural and has a struggling economy, the two said. 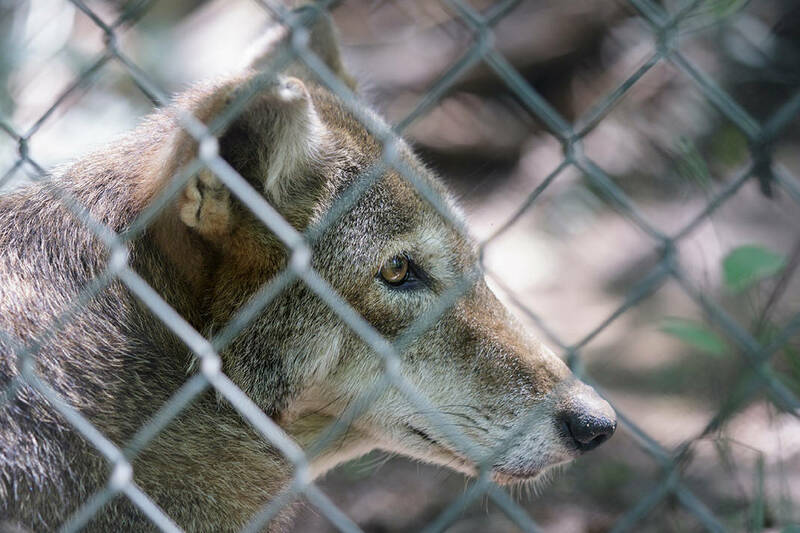 Many of the residents rely on their land and animals for income, but as the number of red wolves has decreased, coyotes have moved into the area and killed crops and farm life. When red wolves stumble across private land, they are often mistaken for coyotes and killed. An increase in red wolves, which are more skittish and rarely kill livestock, likely would drive out many of the coyotes, they said. But it will take time educating the public to shift their mindset on the benefits of the animal. McKnight believes those benefits could lead to a new revenue stream and completely overhaul the area's economy. The Roots-Rated co-founder has firsthand experience building a revenue source out of outdoor experiences. He believes the North Carolina towns are sitting on a potential windfall. The area has black bears, migratory birds, ducks and is the only place red wolves can be found in the wild. He pictures bed and breakfasts, restaurants and tourists coming to visit if the area were to rally around its natural beauty. "I think that's an actual solution," he said. Program participants are now relying on public comment, hoping enough people voice concerns about the proposed plan. "We need to do this together, and we need to introduce some new ideas," Gailmard said. There is an active attempt to extend the public comment period, but as of Friday it is open through today.